Showing 1 - 3 of 3 Products for Truck Bed Organizer. 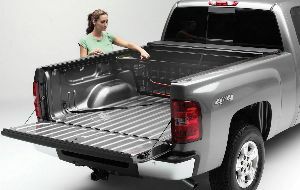 Cargo Manager(R), an optional companion product for Roll-N-Lock(R), is a movable bed divider that can be positioned every 3" along the length of the truck bed to manage and contain lightweight cargo. Controlled from the driver's side, Cargo Manager is repositioned by simply squeezing the control levers. Cargo Manager's spring-activated mechanism then automatically pins the divider to each side track in the next nearest slot. When combined with a Roll-N-Lock retractable bed cover, this dynamic product combination gives truck owners not only the ability to cover and secure the contents of the truck bed, but also prevents objects from shifting in the bed when stopping or turning abruptly.